Huntington's disease (HD) is a hereditary neurodegenerative disorder characterized by motor, psychiatric, and cognitive symptoms. 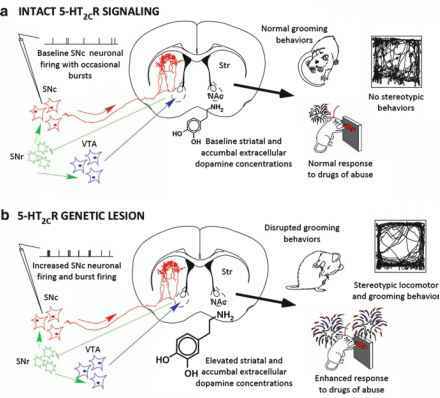 To reproduce some of the biochemical, morphological, and behavioral alterations of HD several acute animal models have been developed. Intrastriatal injection of glutamate analogs, such as kainic acid,1 ibotenic acid,2 and quinolic acid,3 or of a mitochondrial inhibitor, 3-nitropropionic acid,4 forms the basis of some of the best studied models used in rodents. 1 J. T. Coyle and R. Schwarcz, Nature (London) 263, 244 (1976). 2 R. Schwarcz, T. Hokfelt, K. Fuxe, G. Jonsson, M. Goldstein, and L. Terenius, Exp. Brain Res. 37, 199(1979). 3 M. F. Beal, N. W. Kowall, D. W. Ellison, M. F. Mazurek, R. Schwarcz, and J. B. Martin, Nature (London) 321, 168 (1986). 4 E. Brouillet, B. G. Jenkins, B. T. Hyman, R. J. Ferrante, N. W. Kowall, R. Srivastava, D. S. Roy, B. R. Rosen, and M. F. Beal, J. Neurochem. 60, 356 (1993). 5 Huntington's Disease Collaborative Research Group, Cell 72,971 (1993). The aqueous phase is extracted three times with pentane, blown down with N2, and reconstituted in 200 ji\ of acetonitrile. Aliquots of 25 /xl in acetonitrile are injected onto a Beckman (Fullerton, CA) Ultrasphere Qg (3 mm) column in a Waters (Milford, MA) HPLC. The products are eluted isocratically with a mobile phase containing acetonitrile-H20-CH3COOH (34:66:0.1, v/v/v) and detected at three different wavelengths: 307, 325, and 356 nm. The peak for malondial-dehyde is identified by cochromatography with a DNPH derivative of the authentic standard, peak addition, comparison of the UV patterns of absorption at the three wavelengths, and by GC-MS. The amount of MDA is quantitated by performing peak area analysis with Maxima software program (Waters) and is expressed as picomoles per milliliter.